SEATTLE – Committee for Children (CFC), the global leader in research-based social-emotional learning (SEL) education, has partnered with city and state leaders nation-wide to proclaim Monday, October 15, 2018, as Bystander Power Day and October as National Bullying Prevention Month. The proclamation announces the leaders’ commitment to championing bullying prevention strategies and encourages community members to commit to using their bystander power and helping others do the same. Bystander power is a person’s ability to stand up for others and report bullying. Studies show that 70% to 90% of students say they witness bullying at school regularly. Bystanders have the power to defuse bullying situations instead of being passive observers. They can support their peers and create a positive environment by reacting to bullying with kindness and respect and assertively reporting and refusing it. 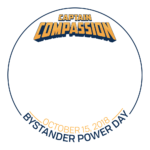 Earlier in October, CFC kicked off Bullying Prevention Month by launching the Captain Compassion campaign. Rooted in research-based resources from the organization’s Second Step Bullying Prevention Unit, the campaign and the proclamation give parents actionable prevention methods to teach their kids how to use their bystander power to help stop bullying. Bystander Power Day is a key focus of the Captain Compassion campaign for gaining nationwide support for spreading this important message about how to stop bullying. For more information on bullying prevention and the Captain Compassion campaign, visit CaptainCompassion.org. Committee for Children is on a mission to ensure children everywhere can thrive emotionally, socially, and academically. Best known for our innovative social-emotional learning (SEL) curricula that blend research and rigor with intuitive program design, we empower children and their adults with skills that help them realize their goals in the classroom and throughout their lives. Since 1979, we’ve been connecting experts in the field to share experiences and advance the cause of educating the whole child. A force in advocacy, we’re helping pass policies and legislation that place importance on creating safe and supportive learning environments. Today, our social-emotional learning and child safety programs reach more than 14 million children in over 70 countries worldwide. By lifting up children today, we’re helping them create a safe and positive society for the future. Learn more at cfchildren.org.